When people think about prepping for survival, they most often think about bugging out, stockpiling food, travel routes, etc. Now many of you might think this is overkill. That’s fine. But I’m of the mindset that you NEVER know when an attack is about to happen and in what form it will come. Sept. 11 was a good example of that. So was Katrina. And look at all the demonstrations that are happening these days? It doesn’t take much for these things to turn ugly…FAST! The number of uses for a pry-bar are endless. The model I carry is the “Exhumer 8” from Dead On Tools. If you’re on the run or bugging out, you can use it for breaching obstacles, gaining entrance to a door or even getting out of a trapped car. I have mine wrapped in 550 paracord and it’s a beast of a self dense tool as both ends are brutally sharp and will seriously jack someone up! 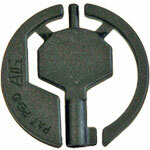 As controversial as it may seem to some, you want to be able to escape from handcuffs if you need to. There are plastic keys now that fit nearly all (or all) handcuffs universally and take up no room at all. I use the one from Magna Light and I’ve sewn my pants tag partially closed so it creates a snug pocket to hide this key. If you’re ever handcuffed behind your back (as in say a home invasion, hostage situation, etc. ), you can easily get the key and unlock yourself or hand it off to someone else to unlock you. The thing about thugs is that they know that the stakes are much higher if they attack a police officer. Now, I’m not saying to impersonate an officer, but let’s say you get trapped in a riot as a result of a demonstration that went horribly wrong. Assuming that police aren’t the target of the demonstrators, having a badge that looks like an officer’s badge could ward off attackers who think you’re just another easy mark as they rampage through the area. You just take out the badge and tell them to “Back off! Just go your way and I’ll go mine and neither of us need to make this an issue. Got it?” and then back out to safety as you assume their agreement. There’s a bunch of other stuff you should carry as well. In fact, I actually carry 29 URBAN SURVIVAL RESPONSE ITEMS on me at all times! Now you’d think that 29 survival items would make you look like you’re loaded up for a trip up Mt. Everest, right? But actually, no one would ever know you’re carrying this stuff! All of the items fit in a small survival bag (that’s only 7″ x 8.5″) that I keep on me, either in a laptop case that I’d normally carry anyway, on my person, or in my “map case bag” from my military days. It’s literally almost like having a Batman Utility Belt on you at all times! You can decide what works best for you, but I’d personally feel naked without these survival items. The confidence you’ll have that you’re prepared for anything is a real comfort in today’s world. A pocket knife with hard metal ends. You don’t have to have a Rambo one to be lethal.Besides ,a pocket knife,even with a 3-4 bladed looks like a lot less trouble to the officials,if they can even see it. A multitool kit wrapped in paracord.I like the one with a small hammer as part of it.Build yourself a beach bungulo or other bolt hole. Leather gloves. Cuts and gashes from barbed wire,glass,fights etc slow you down and can leave a trail of blood.You can also fill a few fingers with sand for a cosh or use it as a drinking skin canteen.Also fewer finger prints. A hard handled pocketknife with metal ends. Don’t need a Rambo one to be lethal,3-4 inches or so. This will also attract less attention fron the Officials, if they can even see it. A multitool kit.,wrapped in paracord and duck tape. I like the kind with a small hammer head.Stick a match or so in it. Leather gloves. A gash or cut can hurt and leave a trail of blood if you from barb wire, broken glass, a fight ,or just opening clams.Stuff the fingers with sand and small pebbles for a cosh,or use it as a skin canteen.Also leaves less fingerprints just in case.Can be a source of bandage material,cut it into twine,or whatever.If you go nuts,you can always cut it into little dollies of finger puppets so you won’t be lonely. I carry a Defender mace pen. You can spray someone if need be and even they won’t know where it came from. It writes too! I keep similar items as well. A good way to find these items to decide is to look up SERE Houdini Kit. Never leave home without these things, and nobody knows I have them on me. Being able to vanish and evade skillfully is mandatory. I carry a multitool, an led keychain light and bic lighter everywhere. My EDC is a LARGE Swiss Army knife with every tool I would need; but not so heavy I would resist carrying it. I carry (wear?) a S&W M&P 45 24/7 even in the shower. My right pocket has a EMT rescue knife. My left ankle carries a Ruger LCP with laser sight. ALL are EDC and surprisingly easy to carry daily. Tool? Everything you use is a tool. I vehemently disagree with carrying a badge of any type. That badge presented at the wrong place and time, WILL get you shot and killed by both the good guys/girls and by the thugs/thugettes. I say this (now as a retired law enforcement officer), while I have a retired badge, it sits in my home office on the bookshelf, with the rest of the accumulated crap I’ve collected over the years. what are you going to do when (and they will) the thugs/thugettes aren’t impressed with our badge, and take it away from you and insert it where the colonoscopy hose goes? It will hurt a LOT worse coming out then it did going in. Second, I don’t know of any professional law enforcement officers/deputies/troopers/agents who will hesitate “enough” in a high stress situation wherein you are presenting a badge(which are very hard to see) to make the instant determination that you aren’t a threat to “them”. I believe that those considerations, make having or displaying a badge in any situation very unwise at any given time. 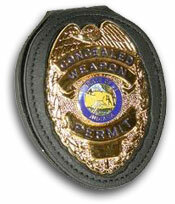 including and especially, the idiotic “concealed weapons permit” badges, which in my subjective opinion, look so much like most agency identifying badges, that they cross the threshold for impersonating a police officer. Again, a third reason to not carry, wear nor present any thing resembling a badge. However, we are all adults, and as such can make whatever decisions we want to, and we must live with the natural consequences of those actions. I agree regarding the badge. This article was written years ago by a guest author and does not necessarily reflect my own opinion. – Just FWIW, in my state (Texas) waving around any kind of badge, like those Concealed weapon permit badges, will get you a quick trip to the Hoosegow for a few days. I don’t carry a badge, but I have to disagree that it’s a bad idea. Yes some people have a bone to pick with law enforcement, and showing a badge to them may only make your situation worse, but the same can be said about pepper spray, a knife, a gun, or any other defense tool shown to the wrong person. You’ve already got this persons attention; what are you going to do? Every tool you carry gives you options. If you’re in a situation where someone is intending you harm and is impeding your ability to remove yourself from the situation, having a badge to flash gives you yet another option to try before escalating to intimidation, or force, both of which should be last resorts, because every time you escalate the situation your chances of survival drop. There’s a saying, “Better to be judged by 12 than carried by 6”, and I think it applies here. Flashing a badge can get you in trouble with the law if you’re deemed impersonating an officer, but if it’s a life or death situation, and you think flashing a badge will help get you out alive, flash the badge, and live to defend yourself in court.